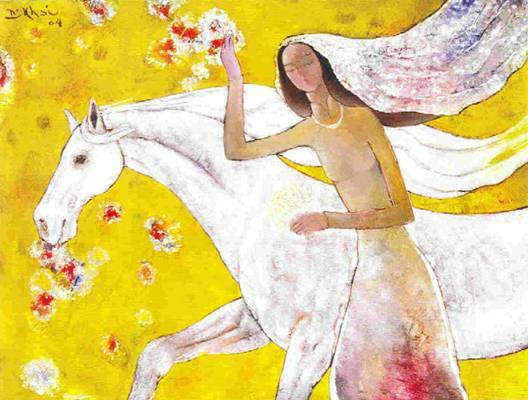 About the artist: NGUYEN KHAI, pseudonym of Buu Khai, born in Hue in 1940, graduated from the National School of Fine Art in 1963, won the Bronze medal at a Spring Art Exhibition in Saigon even before his graduation. One of the founders of the Young Vietnamese Artists Association -- an active and well-known artist group -- in the early 60's, Nguyen Khai committed himself to painting and found it his only way to probe the depth of reality, his inner state, and to pursue the marvellous. While still in his twenties, he became one of the most famous artists in Vietnam. The fall of the South Vietnam forced him to flee his country in 1981, and settled in the American State of California. The painter resumed his painting, and exhibited regularly since then. His most recent exhibitions were at Hoa Mai Gallery, Paris, French (2004), and Viet Art Gallery, Houston, Texas, USA (2005). MOST ‘CA DAO’, PRODUCT OF THE FOLK BUT REALLY VIETNAMESE LITERATURE, ARE LOVE POEMS. MARTHA LACKRITZ, American co-editor of Heritage Magazine (VN), born in 1980 in Texas and educated at Brown University, from where she received her BA in Comparative Literature in 2003. She was then awarded a Fulbright grant to research and translate Vietnamese folk poetry, ca dao, for one year, after which she remained in Vietnam to write and translate. 10 translated ca dao poems published in this issue are taken from Martha Lackritz’s ca dao collection-in-progress (see literature-in-translation below). UYEN NICOLE DUONG, pseudonym of Duong Nhu Nguyen, was born in Hoi An Quang Nam, brought up in Hue and Saigon (former capital of South Vietnam). Uyen Nicole Duong received her B.S. in Journalism / Communication from Southern Illinois University, J.D. from University of Houston (Texas), and LLM from Harvard Law School (Cambridge MA). She is believed to be the first Vietnamese Municipal Judge in the United States (Serving in Texas: Associate Municipal Judge, City of Houston, and Magistrate for State of Texas; honoured by the American Bar Association at “Minority Women in the Judiciary” conference – NYC, 1992). Practicing law but she sees herself primarily as a writer, and writes in two languages: Vietnamese and English. Her pieces in Vietnamese appeared in numerous literary magazines, her English's in Tap chi Song-Van and Pacific Rim Law & Policy Journal. Uyen Nicole Duong's first book 'Mui huong que', a collection of short stories published by Van Nghe Publisher in 1999 was followed by ‘Daughters of the River Huong’ published by RavensYards (2005). Another collection of stories, ‘Chin Chu Cua Nang’ will be published by Van Moi Publisher in the summer of 2005. Her short story The young woman who practiced singing originally published in Song-Van Magazine under pseudonym NhuNguyen Nicole (January-April issue, 1988) won two awards, one of which was the Stuart Miller Writing Award organised by District of Columbia Bar Association, 1988. Her short story The Ghost of Ha Tay published in Volume 4-Number 2-July 2002 was a finalist selection for the Columbine Award of the Moondance Film Festival 2001. Uyen Nicole Duong also writes articles, critiques. Her article "Gender Issues in Vietnam – The Vietnamese Woman: Warrior and Poet" appeared in the Pacific Rim Law & Policy Journal, University of Washington, College of Law, March 2001. AIDAN ANDREW DUN, British poet, born in London, raised for ten (in)formative years in the West Indies. He lives now on Parliament Hill in North London. His two epic poems were published in the United Kingdom by Goldmark (Vale Royal, 1995, Universal, 2002). The first earned praise from Derek Walcott, who said 'Vale Royal moves with the ease and the clarity of a fresh spring over ancient stones, making its myths casual, even colloquial-- an impressive achievement.' The subject of Vale Royal, (composed in terza rima,) is the psychogeography of ancient Kings Cross in central London. Twenty three years all-making, Vale Royal earned Aidan Andrew Dun the title Poet of Kings Cross. Universal, in twelve cantos, has been widely reviewed. Aidan Andrew Dun’s third epic is now in first draft, a fourth in preparation. His shorter poems have appeared in many British and some European journals. The London Magazine has published, as well as many shorter pieces, two medium length poems, one of which, Three Kings Passage, ran to twenty seven pages. His work is now beginning to appear via selected internet literary journals, among them The Aurora Journal, Projected Letters, Contrary, Avatar, Interpoetry, The Wissahickon, and The Dogwood Journal. Colibri is Aidan Andrew Dun’s first appearance in The Writers Post. QUE SON, pseudonym of Ho Ngoc Son, born Nov 25, 1960 in Da Nang Viet Nam. His first published work, “One Spring morning”, appeared in the January 2005 issue of The writers Post. “A moment in Hanoi” is a memoir of his recent visit to Vietnam. Que Son lives in Brooklyn, New York. DANG THAN, pseudonym of Dang Xuan Than, born in 1964 in North Vietnam, lecturer, writer, poet, translator, and interpreter. He teaches American and English literature at a number of universities in Hanoi since 1990, currently serves as the Training Director at the IVN Institute for Research and Support of Education Development, concurrently in charge of Dean of Futurology Studies at the I Ching Research & Development Center in Hanoi. In the field of translation, he is one of the most reliable simultaneous translators in Vietnam, simultaneously interpreting from and into Vietnamese, English (verbally and live from translation booths) and covering, at a conference or seminar or meeting, a wide range of fields: economics, culture, technology and science, literature and the arts, poetry, and more. In the field of literature, he writes in two languages: Vietnamese and English. He began the road to his literary success with his prose and verse published in the print or electronic magazines based in Vietnam, Australia, Germany, and the US: Nguoi Ha Noi, Ngay Nay, Khao Cuu Van Hoa Phuong Dong, Khoa hoc va Doi song, Nhan Dan, eVan, Song Cuu Long, Talawas, Tien Ve, Tan Hinh Thuc, Tap chi Tho, and Gio-O. Apart from published work in Vietnamese, his poems written in English or in English translation have appeared, in the US, in such anthologies of poetry: The Colors of Life, Eternal Portraits, and Who’s Who in International Poetry, which were published by Watermark Press and The International Library of Poetry; and in the UK, in such anthologies: Colours of the Heart and Labour of the Heart published by Noblehouse Publisher. Dang Than has in preparation an anthology of poetry entitled ‘Tao’s Poetry – or the Poetic Pursuit of the Truest-self’. He is living in Hanoi, Vietnam. MARTHA LACKRITZ, currently co-editor of the bilingual Vietnam Airlines in-flight Magazine, Heritage, born in 1980 in San Antonio, Texas and educated at Brown University, from where she received her BA in Comparative Literature in 2003. She was then awarded a Fulbright grant to research and translate Vietnamese folk poetry, ca dao, for one year, after which she remained in Vietnam to write and translate. She has in preparation a collection of ca dao-in-translation, and spent the last two years to collect a number of ca dao poems and translate them into English. As folk poetry, ca dao belongs to oral tradition, origin unknown, handed down by word of mouth from generation to generation over a long period of time, being deeply ingrained in Vietnamese culture, engulfing the country in the spirit of poetry and love, and poetically expressing the way of life and feelings of the Vietnamese people. Most ca dao, product of the folk but really Vietnamese literature even when not written down, are love poems. Although not herself a translator who knows well the original language at the beginning of her project, the young Lackritz had shown that she was making the effort. The intention had been a collection of two thousand original and translated ca dao poems. Of one thousand poems she has risen to the challenge to collect, 400 hundred poems had been translated into English so far. The book is planned to be published in the US in 2006 to introduce Vietnamese ca dao to English-speaking world. 10 translated ca dao poems published in this issue are taken from Martha Lackritz’s ca dao collection-in-progress. THANH TON, pseudonym of Le Thanh Ton, born on 09-09-1943 in Loc Phuoc, Dai Loc, Quang Nam; he served in South Vietnam Armed Forces. After the fall of Saigon in 1975, he was arrested, and sent to a hard labour camp for seven years from 1975 to 1982. Thanh Ton immigrated to the US in 1997, where he settled. He published his debut collection of poetry “Tinh Nguoi Song Thu” in 1964 (limited edition, co-authored with Hoang Quy and Thai Tu Hap), which was followed by Thap Tinh (Vietnam, Nguong Cua, 1969). Thanh Ton' s short stories and poems appeared in many literary magazines published in Vietnam before 1975. OANG XUAN SON, or Su Mac (pseudonym), born in Vy Da-Thua Thien (Vietnam) in 1942 (registered as 1947 in his birth certificate), teacher and public servant, who was educated at universities from where he graduated: University of Saigon (Bachelor degree of Education -Western philosophy), and University of Dalat (Master of Business Administration). Hoang Xuan Son began writing poetry in 1963. His first poem 'Ngay be lon len' appeared in Van magazine in 1964 (the magazine was then under the editorship of Tran Phong Giao, published by the publisher Nguyen Dinh Vuong), was followed by many others published in Van, Chinh Van, Nghien Cuu Van Hoc, Khoi Hanh, Thoi Tap, Nha Van magazines. In 1981, he left Vietnam for Canada where he settled. ‘Vien Pho’, his first collection of poetry published in 1989 by Viet Chien Publisher was followed by ‘Hue Buon Chi’ published in 1993, and ‘Luc Bat Hoang Xuan Son’ published by Thu An Quan in 2004. Beside these three publications, Hoang Xuan Son's poems have appeared in numerous literary magazines, anthologies, and electronic literary magazines on the World Wide Web published or based in the US and Canada. A new poetry collection Tho Quynh and a CD titled Quynh Huong that presents the songs of ten distinguished songwriters are in preparation. NGUYEN PHAN THINH, born in 1943 in Ha Nam, resettled in South Vietnam in 1954. He started in the literary community with his poems contributed to several magazines published in Saigon, including Mai, Tieu Thuyet Tuan San, Van, Van Hoc, Van De, Bach Khoa. After 1975, he contributed to Vietnam and overseas journals: My Thuat Thoi Nay, Tri Thuc, Van Nghe Tp.HCM, The Gioi Moi, Kien Thuc Ngay Nay,Van Tuyen, Van Chuong (VN), Tap Chi Tho, Van Hoc, Hop Luu, Khoi Hanh, Thu Quan Ban Thao, Tien Ve, Talawas. He is the author of four books of poetry. SONG NHI, born in Ha Tinh (Central of VN) in 1938, was a high school teacher, a newspapers columnist, the Director of Studies of Truong Minh Giang Center of Adults Education in Saigon (1967-1972), editor-in-chief of Huong Di Magazine published by the Federation of Student Associations of Van Hanh University (Saigon: 1965-1968), editor-in-chief of Mau Lua Magazine (1968), staff-writer of the Infantry Periodic (Thu Duc Infantry Academy, 1969-1970), a military officer seconded to the Administrative and Personnel Service at the Presidency, Chief of the Press Bureau (1971-1975), and staff writer of Quat Cuong Daily Newspaper. Emigrated to the US where he resettled in California in 1993, he resumed his writing career as a columnist for and contributor to Vietnamese daily newspapers and magazines in the US and Canada, including Duyen, Dat Dung, Vietnam Daily News, Thoi Bao, Chanh Dao, Chien si QG, Saigon Nho, Vien Xu, Dan Ta, Huong Viet, Saigon Post, Dien Dan PN. Co-founder and Executive Director of Coi Nguon Foundation of Poetry and Prose since 1995, Song Nhi is also the editor-in-chief of Trang Van Hoc Coi Nguon (Vietnam Times, Northern California), editor-in-chief of the electronic magazine Van Nghe Coi Nguon at the website: http://www.coinguon.org, and managing editor of Nguon Magazine (Northern California). KHE IEM, Vietnamese playwright, storywriter, poet, editor. Born in 1946 in Nam Dinh, North Vietnam, he went into immigration in South Vietnam after the 1954 Geneve agreement divided Vietnam into two separate parts and set each part under a different political regime: Communist North and Capitalist South Vietnam. “Hot Huyet”, his debut literary work, a play, appeared in South Vietnam in 1972. Thirteen years after the Communist conquest of South Vietnam in 1975, he escaped Vietnam by boat in 1988, spending a year in a refugee camp in Malaysia before coming to the United States in 1989, where he settled in California. In 1994, he founded Tap Chi Tho, a very successful poetry magazine which is under his editorship until 2004 (Poetry Magazine, US: Premier Issue launched in Fall 1994). He also published his other books: “Thanh Xuan” (poetry. US, California: Van, 1992), “Loi cua qua khu” (story collection. US, California: Van Moi, 1996), “Dau Que (poetry collection. US, California: Van Moi, 1996), “Tan Hinh Thuc, Tu Khuc va nhung tieu luan khac” (literary essay. US, California: Van Moi, 2003). In 2005, he founded the Website Tho Tan Hinh Thuc supporting Post Modernism and New Formalist poetry. Khe Iem has in preparation an anthology of New Formalist poetry, and is currently working with poets and translator DO VINH (joseph dovinh tai), who is the author of “Green Plums”. The anthology, which is intended for at least a hundred and eighty poems by sixty poets, and of which at least sixty of the poems are English translations, will be published bilingually, barring unexpected delays, at the end of this year. “Question” by Giang Anh Ien, “Call it living” by Dinh Nguyen, “The attendant lady” by Do Kh., “Releasing reincarnation” by Doan Minh Hai, “Act (1)” by Duc Pho, “Corpse” and “Just chatting” by Nguyen Dang Thuong, “Night in tenderloin” by Luu Hy Lac, “A little memory of Monaco” by Nguyen Canh Nguyen, and “Tsunami Tsunami” by Nguyen Luong Ba which appear in this issue are taken from this anthology-in-progress. Khe Iem has in preparation an anthology of New Formalist poetry, and is currently working with poets and translator DO VINH (joseph dovinh tai), who is the author of “Green Plums”. The anthology, which is intended for a hundred and eighty poems by sixty poets, with at least sixty added translation versions, will be published bilingually, barring unexpected delays, at the end of this year. The following poems are taken from Khe Iem’s anthology-in-progress. GYANG ANH IEN, pseudonym of Bui Duc Nguyen Vu, born on March 05, 1984. He participated in the 2000 and 2005 competitions for students, and won two awards; the 2000 award was for essay on forestry, and the 2005 poetry. Gyang Anh Ien’s poems appeared mostly in Tap Chi Tho magazine, and recently via electronic journals, including Tien Ve, Tan Hinh Thuc. 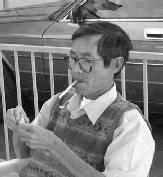 His collection of short stories is scheduled to publish in October, 2005 by Kim Dong Publisher. He is living in Vietnam. DINH NGUYEN, pseudonym of Nguyen Dinh Dinh, born on April 12, 1942 in Hai Duong, North Vietnam, former officier in the South Vietnam Armed forces. He immigrated in 1985 to the US and has since settled in California. Before 1975, he contributed to several magazines published in South Vietnam. In the overseas, his works appeared in Van Hoc Nghe Thuat, Van, and Van hoc. He is the author of three books, Duong Xuong Trang, novel; Tho Dap Mat, poetry; and Que huong, poetry. DO KH., pseudonym of Do Khiem, born in 1954 in Hai Phong, North Vietnam. He came to France in 1968. Returning to Vietnam, he joined the Armed Forces in 1973. After the collapse of South Vietnam, he immigrated to France in 1975 and subsequently moved to the US, settled in California. Do Kh. started in the literary community in 1987, and was on the editorial board of Tap chi Tho and Hop Luu magazines. He is the author of four books: Cay gay lam mua, story, 1989; Tho Do Kh., poetry, 1989; Co nhung buc minh tuc khong the noi, poetry, 1990; Ky su di Tay, travelling notes, 1991.
ÿ RETURN TO CONTRIBUTORS ÿ Do Kh. DOAN MINH HAI was born on January 6, 1941 in Hai Duong, Hai Phong. After the 1954 Geneve agreement divided Vietnam into two separate parts, Communist North and Capitalist South Vietnam, he went into immigration in South Vietnam, where he setteled in Da Nang. He started writing poetry in 1958, contributing to several literay magazines and daily newspapers published in Saigon, including Pho Thong, Van Nghe Hoc Sinh, Ky Nguyen Moi, Ma Thuong, Gio Ngan Phuong, Gio Moi, Giu Thom Que Me, Doi Thoai, Truoc Mat, Khoi Hanh. Doan Minh Hai is the author or co-author of four poetry books, and founder of Cung Kho magazine. In the overseas, his poems appeared in Hop Luu magazine published in the US. He is living in Ho Chi Minh City. DUC PHO, pseudonym of Nguyen Duc Pho; he was born in 1948 in Thua Thien, Central Viet Nam. He joined the South Vietnam Armed Forces; after the fall of South Vietnam he resettled in the US in 1996. He started writing before 1975 with different pseudonyms. Many of his pieces were published in the literary magazines Van, Van Hoc, Hop Luu, Chu De, Tap chi Tho, Van Tuyen, Pho Van, Quang Da. Author of two poetry books: Mot cho ve (US: Song Thu, [? ]), Mua tinh xin kip gat (CA: Van Moi, 2002). NGUYEN DANG THUONG, former French teacher at several high schools in Saigon, born Oct 28, 1958 in Svay, Kampuchia, educated in Vietnam and graduated from Saigon University’s Faculty of Pedagogy. He is the author of four books of translation including the most recent Tieng noi (US: Van, 2003), a Vietnamese translation of ‘Voix’ by Linda Le (France: Christian Bourgois, 1998). His works have appeared in Nhip Cau, Thuy Trieu, The Ky 21, Trinh Bay, Hop Luu, and Tap chi Tho literary magazines. LUU HY LAC, pseudonym of Vuong Minh, born in 1954 in Ha Tien. He escaped Vietnam by land, came to the US in 1982, and has since lived in San Francisco, California. He is the author of Yen Di (1999). His New Formalist poems appeared mostly in Tap Chi Tho, and recently via the electronic journal Tan Hinh Thuc. NGUYEN LUONG BA was born in 1944 in Thua Thien (Central Vietnam) and educated at Hue University Faculty of Letters, Dalat University Faculty of Pedagogy. In 1967, he founded Hanh Dong Magazine (co-founded with Ton That Lap, Nguyen Phu Yen, Le Van Ngan, Tran Van Ha). His two collections ‘Nhat ky duoi ham tru’ (short story) and ‘Nguoi co don’ (poetry, co-authored with Nguyen Phu Yen) were published in roneo-ed form in (?). He is living in Texas. INRASARA, pseudonym of Phu Tram, born 1957 in Chakleng, Ninh Thuan and educated at High School Po-Klong (1969), Faculty of of Pelo in Ho Chi Minh City (1977). In 1978 he lelf the university without taking a degree for wandering and writing poetry. He is the author of more than fifteen books of poetry, research and translation, and winner of several literary awards. Apart from his books, he published more than three hundred pieces of essays, poems, short stories and travelling notes in many journals at home or abroad, including Nha Van, Van Nghe, Van Nghe Tre, Van Nghe Dan Toc, Van Tp. Ho Chi Minh, and Tap chi Tho. KINH DUONG VUONG, pseudonym of Nguyen Tuan Khanh, artist, poet, and short story writer, born in Kampuchea in 1941, known as Rung for his painting, Dung Nham/Co Dong for poetry, and Kinh Duong Vuong for short story. He had contributed to numerous literary magazines in Saigon, including Bach Khoa, Van, Van Hoc, Y Thuc, Chinh Van, Tan Van. Dung Nham/Co Dong's poems and Kinh Duong Vuong's short stories recently appeared in a number of literary periodicals published in the US: Van Hoc, Hop Luu in California, Song Van in Florida. 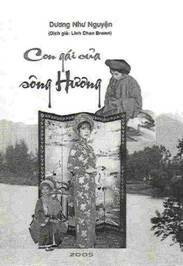 Kinh Duong Vuong's Chiec Mat Na Cuoi, the first collection of short stories, was published by Van Moi Publisher in 1997. In the field of art, Rung's most recent exhibition was at La Artcore Center At Union Center For The Art. His paintings are showcased at TU DO Gallery. PRESS RELEASES & UPCOMING EVENTS: DAUGHTERS of the RIVER HUONG, a novel by Uyen Nicole Duong, author of Mui Huong Que, is published by RavensYard Publishing, Ltd. (more information about the book is available on RavensYard web site). INTERVIEW BY RAVENSYARD PUBLISHING LTD.
Duong Nhu Nguyen, by the same press, in 2005. A novel by Uyen Nicole Duong, author of Mui Huong Que (Mui Huong Que was published under her real name Duong Nhu Nguyen), to be published soon by Van Moi Publisher. The book is due to reach the market in May, 2005.